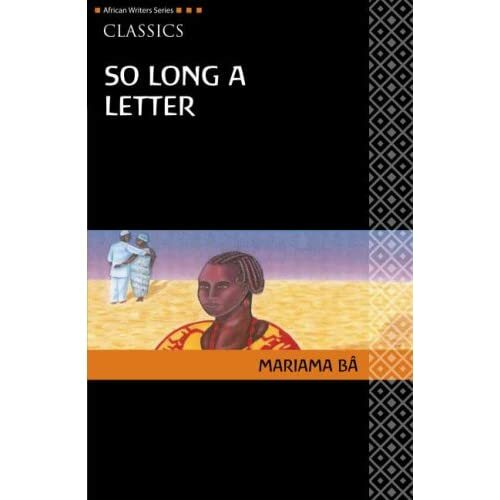 So Long a Letter is a landmark book - a sensation in its own country and an education for outsiders. Mariama Ba, a longtime women's activist, set out to write a book that exposed the double standard between men and women in Africa. The result, So Long a Letter, eventually won the first Noma Award for Publishing in Africa. The book itself takes the form of a long letter written by a widow, Ramatoulaye, to her friend, over the mandatory forty-day mourning period following the death of a husband. Both women had married for love and had happy, productive marriages; both were educated, had work they loved and were intellectually alive. During their lives, both of these women's husbands chose to take a second wife - and each woman then made a different choice. Ramatoulaye decided to stay married, although it meant rarely seeing her husband and knowing that he was squandering money on a young girl, a friend of her own daughter. Ramatoulaye's friend divorced her husband and eventually left the country, settling in the United States. In her letter, Ramatoulaye examines her life and that of other women of Senegal - their upbringing and training and the cultural restrictions placed upon them. It is a devastating attack, made all the more powerful because of the intelligence and maturity of the narrator and the ability of Mariama Ba to honor two very different choices within one framework. -- For great reviews of books for girls, check out Let's Hear It for the Girls: 375 Great Books for Readers 2-14. -- From 500 Great Books by Women; review by Erica Bauermeister --This text refers to an out of print or unavailable edition of this title. Text: English, French (translation) --This text refers to an out of print or unavailable edition of this title.